A lush green lawn can be the envy of the street. A simple maintenance routine can ensure your lawn looks amazing all year long! A good foundation is essential to successful establishment of new turf. Getting the soil right before planting will help start the new lawn off on the right foot. TIP: Dig in some composted poultry manure into the soil prior to planting to encourage soil biology and improve moisture retention. Super Booster Pellets are ideal. After the turf has been installed it is important to keep traffic off it for the first 4-5 weeks and to water well to ensure the roots spread and grow deep into the soil. Applying a liquid seaweed fertiliser like Neptune at the 6 week mark can be beneficial as it is a great overall health treatment. 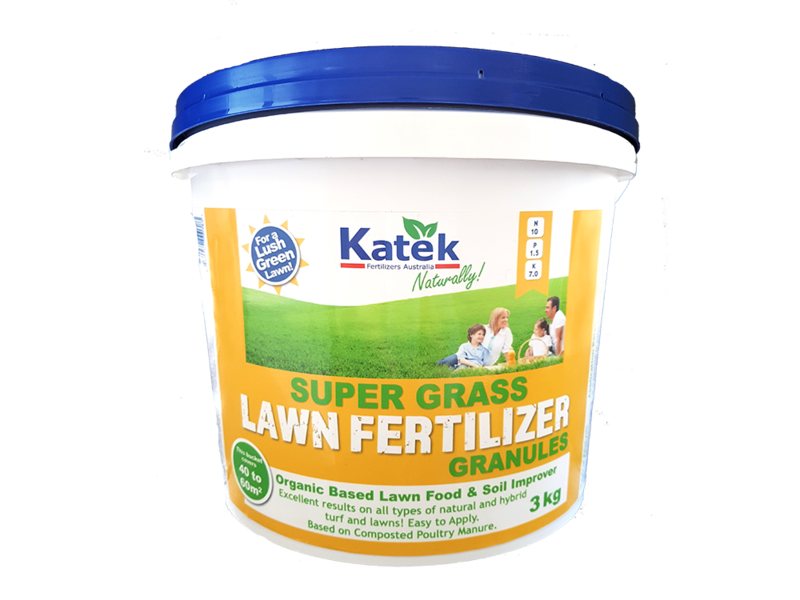 An organic registered slow release fertiliser like Katek Super Growth Pellets is a great source of nutrients that the grass will benefit from at this growth development stage. Overwatering is actually worse for grass than underwatering. Water replaces the air in the soil, which will starve the soil of oxygen and inhibit growth. The amount of water needed will change depending on the season and the type of soil. Watering deeply rather than a little bit every day encourages the turf to develop a nice deep root system, which helps reduce heat stress in the Summer and means the roots will not dry out easily. Watering first thing in the morning, rather than at night is something the experts agree on. If at any time you notice any wilting or discolouration in the leaf, its time to increase your watering habits. TIP: Always water well after applying fertiliser. A year-round fertilising program supplying regular nutrients is the key to keeping the lawn in great health. A lush carpet of healthy lawn is more resilient and able to repair from damage and will keep it resistant to drought and disease. Poultry manure is a great, nutrient rich fertiliser for your lawn. All lawn types, including Buffalo, Carpet Grass, Couch and Sir Walter love chicken manure based fertiliser and will respond with healthy green growth. In Spring, it is useful to use a higher nitrogen complete fertiliser such as Super Grass as this will help the lawn recover from Winter and get back to being green and healthy. This is the time of vigorous lawn growth! One application of fertiliser during this high growth period will keep your lawn looking its best. Now is the optimum time to start feeding your lawn and getting ready for the change to cooler weather. Regular applications of fertiliser every 6-8 weeks from March through to May will help prepare the lawn for Winter. TIP: Composted poultry manure is full of live beneficial microbes and rich in plant available nutrients which helps to build soil health and resistance to pests and disease. Healthy soil = a healthy lawn! For an established lawn, it is recommended to use Super Grass at 50-75g per square metre. Granular or pelletised products are easy apply by hand or with a hand held spreader. It is essential to water thoroughly after application. Do not apply if the maximum temperature is expected to be 30 degrees celcius or above or if the grass has been suffering from heat or moisture stress. 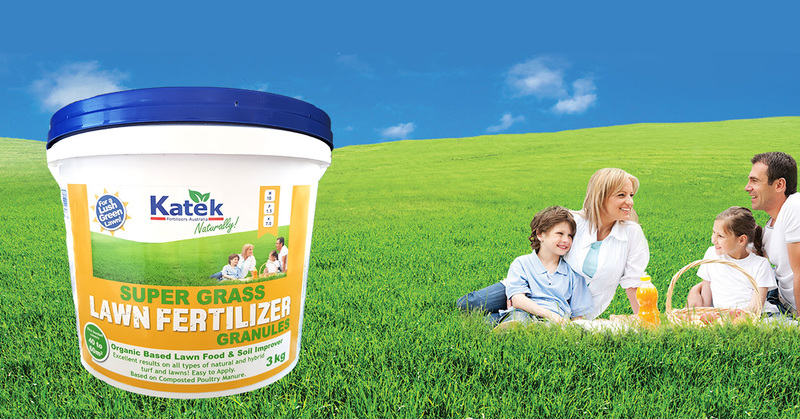 Small regular fertilizing provides consistent essential nutrients for strong sustainable development and growth. TIP: Water in thoroughly. For an even application use a hand held spreader.